Pressure canners enable food to be heated to above boiling temperature. This is required for non acidic foods to ensure that potentially harmful bacteria is destroyed. Some non acidic foods may be made sufficiently acidic by the addition of vinegar or lemon juice but this is not always desirable. The price difference between canners represents the difference in quality and design. The All American canners are the highest quality canner currently on the market. They use a metal on metal seal, removing the need for a rubber gasket. Choose a canner according to the number of jars you want to process at one time: for most customers this is usually a size between 20 and 30 quarts / litres. Pressure canners currently only come in stove top versions and not as an electric unit. Due to the weight of a heavy canner they are not suitable for glass stove tops. The canner will not work on an induction stovetop. Many preservers have a standalone gas burner for use with their pressure canner, as this also allows easier access than may be afforded by a stovetop with an exhaust hood. Presto® 23-Qt. Pressure Canner Note: picture shows the standard 15psi regulator but the our custom option replaces this regulator with the superior 3 piece regulator.Imported directly from the Presto factory and custom made for our company we proudly present the Presto Pressure Canner & Cooker. In the USA bottling is called canning and this unit is a common household item there.It can be used to bottle fruit on the stove top and is considered to be the only safe way to bottle non-acidic foods such as vegetables as well as meat fish soups and sauces.A must-have for canning veget..
All American 30 Quart (28.5 Litre) Pressure CannerBottle Almost Anything! NO GASKETS! Bottle meats, fish, vegetables and fruits with the famous All-American pressure preserver! Only All-American Pressure Cookers/Canner feature an exclusive, precision machined "metal-to metal" sealing system. Positive action clamping locks align the cover to the base, forming a steam-tight seal. At the same time, this metal-to-metal seal automatically permits venting under unusual pressure conditions, providing an extra margin of safety over conventional rubber or composition gasket co..
All American 41 Quart (39 Litre) Pressure CannerBottle Almost Anything! NO GASKETS! Bottle meats, fish, vegetables and fruits with the famous All-American pressure preserver! 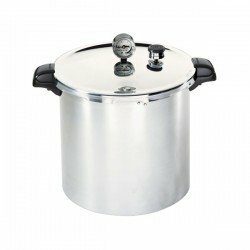 Only All-American Pressure Cookers/Canner feature an exclusive, precision machined "metal-to metal" sealing system. Positive action clamping locks align the cover to the base, forming a steam-tight seal. At the same time, this metal-to-metal seal automatically permits venting under unusual pressure conditions, providing an extra margin of safety over conventional rubber or composition gasket cookers.The All-Americ..
All American Steriliser Aluminium Container AA-2164This aluminium container is designed to fit the All American Steriliser Model 1941X. Height 8 1⁄2" / 21.6cm Diameter 11 1⁄8" / 28.3cm Circumference 35 7⁄8" / 91.1cm Capacity 14.5 qt / 13.7 liter Volume 835in3 / 13,688cm3 ..